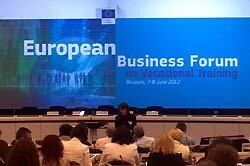 The first European Business Forum on Vocational Education held in Brussels on 7-8 June 2012 entitled “challenges and trends in skills and career development of the European workforce” sought to explore and address issues regarding organisational approaches to skills development within the broader workforce, including adult and young workers alike. The opening of the event was managed by Mr. Jan Truszczynski, Director General for Education and Culture and Mrs. Christine Antorini, Danish Minister for Education who set the scene of the current situation faced by the European economies and outlined the potential to achieve smarter, more sustainable and inclusive growth only through a better qualified and adaptable workforce. Both speakers stressed the role of companies in the development of skills and competences as well as necessity for a greater cooperation between VET providers and employers. 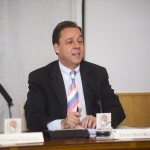 EOSE was represented by the Executive Director Mr Aurelien Favre and the event brought together around 330 key stakeholders including representatives of businesses, experts, providers of vocational training, policy makers, chambers of commerce, research institutes, business associations and sector organisations. Specific questions: How to strengthen the engagement of companies in EU actions? What are the critical factors, the ‘to-do’ and ‘not-to-do’ aspects? What do companies gain from taking part in activities such as Sector Skills Alliances and under what conditions do the benefits out-weigh the costs? 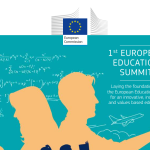 Specific questions: How can enterprise-education partnership and cooperation be improved to meet future skills requirements? What steps can be taken at EU level to ensure better fit between the skills needs of businesses and education/training provision? This conference gave EOSE a good opportunity to exchange with various stakeholders and sectors, to disseminate information about the challenges and work carried out through the Sport and Active Leisure sector, but also to obtain concrete information on the main priorities of the future policies of the European Commission in terms of Education and Employment issues. 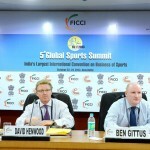 Final Report of the Forum can be found here.